Okay, I get it. We have two children calling each other names in the schoolyard of life. 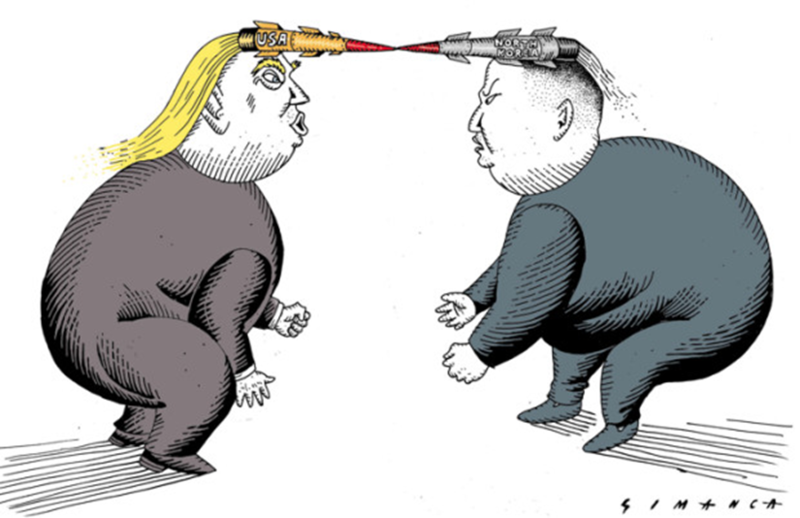 The alarming issue is that these two fake adults are so immature and bombastic that WWIII is getting very close. Tragically, there is no level-headed person who is able to take these to kids to the principal. 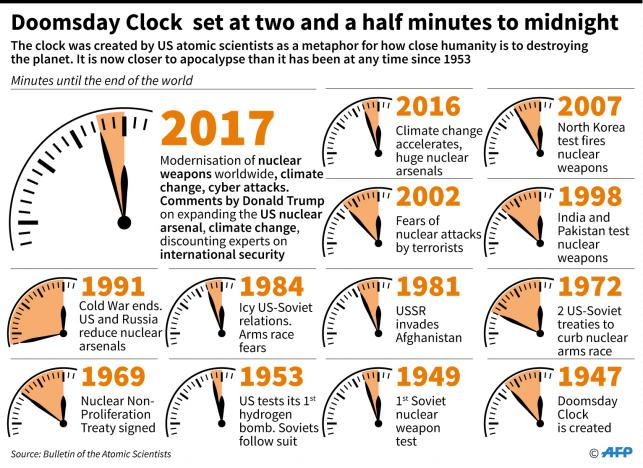 After WWII, the Science and Security Board of the Bulletin of the Atomic Scientists created the Doomsday Clock. It was a visual means to show people just how close we are to another World War...this time a massive Armageddon. This is where the clock was prior to the two bullies fighting in the global schoolyard. 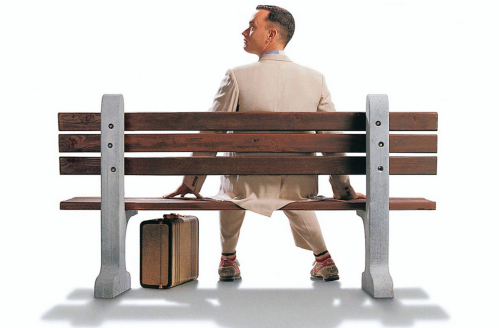 It is now two and a half minutes and ticking. Interestingly, Albert Einstein said, “I know not with what weapons World War III will be fought, but World War IV will be fought with sticks and stones.” Tragically, we seem to be rushing headlong into a global disaster. During the Cuban Missile Crisis, John Kennedy thought before acting. 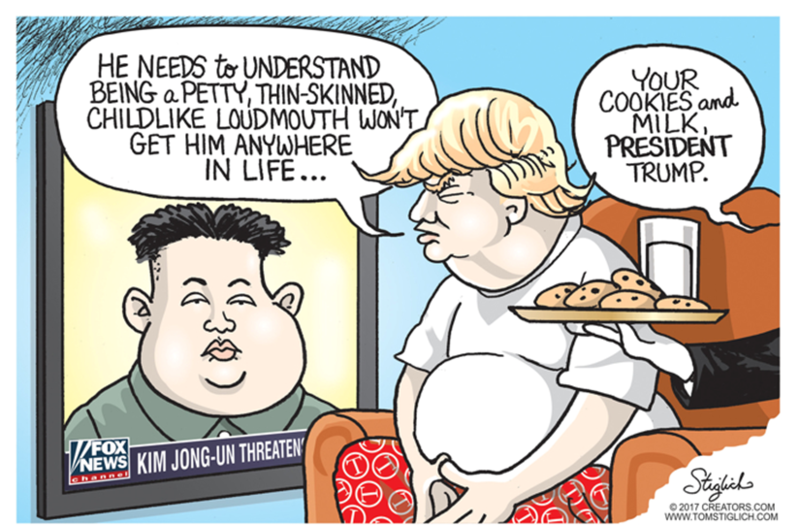 Is there anyone in the world that thinks our fake president, Donald the Dumb, can stand back and to see the larger picture? 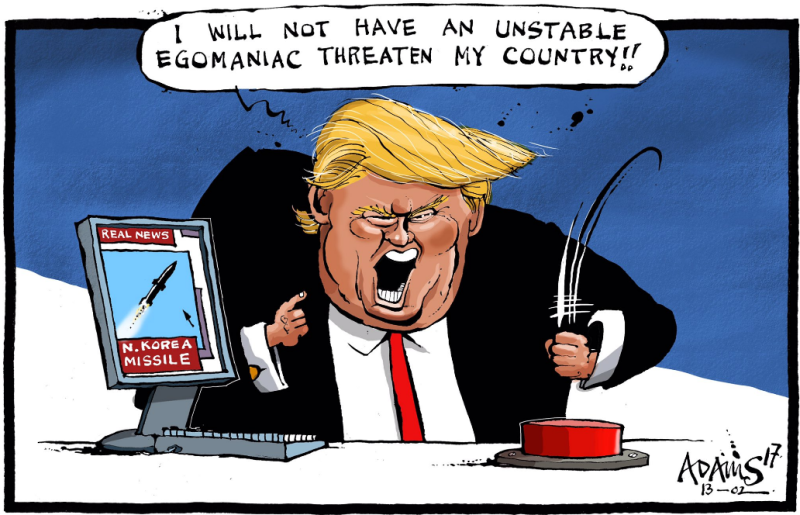 ...and you are not an unstable egomaniac? 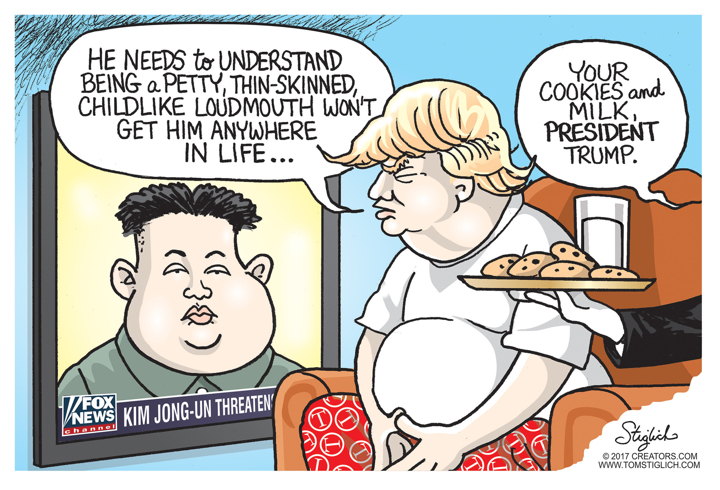 However, the other giant among these two crazy leaders also has ego problems. 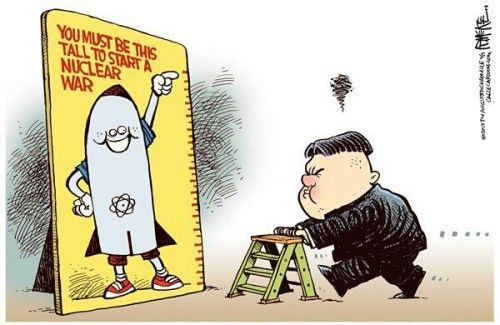 Kim Jong-un is attempting to man-up. Back home in the White House, Donald the Dumb is being taken care of. In conclusion, our fake president gets up early...to tweet. People who act like they are macho are in fact suffering from feeling inferior when it comes to their masculinity. 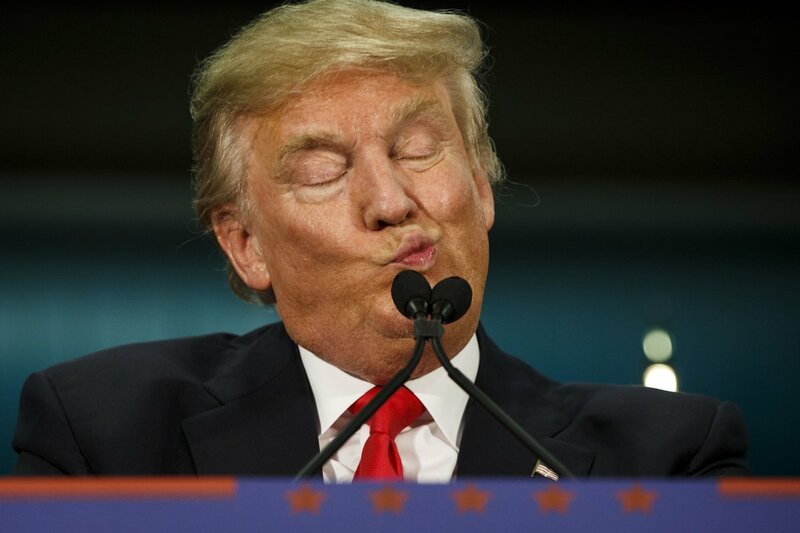 Perhaps, we need to ask women about Donald the Dumb’s masculinity. Having Donald the Dumb as our fake president embarrasses me as an American. In addition, while I was still in college, Dr. Strangelove was released. Little did I know that Major Kong would reappear as Donald the Dumb a half century later.